Many 2nd graders and early 3rd graders will consider fractions and whole numbers to be entirely different animals. A fraction is a fraction; a piece of a pie, a portion of a square. A whole number is something other; an indivisible round, an atomic whole. But third grade is the time when children come to terms with the continuity between fractions and whole numbers. That there are fractions which are simply ‘names’ of whole numbers will surprise some of your students, but it will be a good surprise that can open the doors into future ease in fractional manipulation. This lesson also builds on the concept of ordering fractions, a topic that is introduced in a previous MathWarehouse lesson. You want your students to become fluent at comparing the landscape of ‘fraction land’. Your aim is that they would be able to tell you on sight which is the greatest of two fractions, given either a similar denominator or a similar numerator. Draw a half circle on the board, and ask your student if they can tell you some of its names. If they’ve been exposed to ‘fraction names’ in Mathwarehouse’s Discovering Equivalence lesson plan, they should be able to help you come up with a long list as they mentally divide the circle into more and more segments: ½, 2/4, ¾. Now draw another circle on the board and shade the whole thing. Ask your students if they know the names of this portion. Write ‘1’, beside the circle, and wait for more suggestions. If a student comes up with 2/2 for a suggestion, draw the dividing line, tell him he’s right, and put the fraction down on your list. 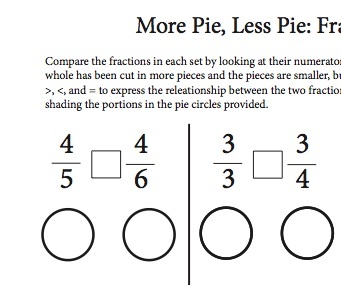 Encourage your students to continue mentally dividing the filled circle to create more fractions. Once you have a long list, ask them how much longer they think it will be. Discuss how it is a list that can go on forever, because you can always divide every portion into smaller and smaller portions. The numbers on the top and bottom of your fractions—always the same—will just keep on getting larger and larger and larger, and there is no end. Now tell your students you have a very long list of numbers; suggest you put them all on a numberline. Draw a large numberline on the board and write on designations from one to ten, leaving room for continued expansion on the right. Ask for volunteers to come up and write the fractions on the numberline. This is, in a way, a trick question; because the way the question is set up assumes that the names are separate numbers and will go to different points. If your students are awake and used to thinking through problems rather than parroting answers you should have at least one willing to challenge your statement: pointing out that the list is not a list of numbers, but a list of names of one single number. If anyone makes this objection, ask him or her to get up and demonstrate this to the class. This can be done by dividing the area between 0 and 1 into two portions, and counting down both of them for 2/2; dividing the area into three portions, and counting down all three for 3/3, and so forth. If no one objects to the graphing of the ‘numbers’ give chalk to three or four volunteers and divide the list up between them, asking them to mark each of those numbers on the number line. They may stare at the board confusedly, they may begin marking the integers they see on the numerators, they may try to do fancy calculations, or they may all dash for the point ‘1’. Give them the time they need to think through the problem and make mistakes, and only call a halt on the project once they tell you they have the numbers all marked. Then, give appropriate feedback: if they’ve marked it correctly, tell them so, and ask them to explain to the rest of the class why all those points are one point. If they have marked the ‘numbers’ on separate points, ask them to demonstrate their ‘orderings’ with pictures. It is important that you give them the time they need to discover the locations of these ‘cognates of 1’ on the number line, by whatever circuitous route they take. They will learn much more by making mistakes and following through to the dead ends that follow—and then rethinking the problem and finding the right answer—then they would if they were given the correct interpretation straight off. The circuitous, labored path will also cement the final concept in their minds in a way you’d never have been able to teach if you were the prime mover. When your volunteer discoverers have come to the conclusion that every one of the ‘numbers’ is one, follow up on the concept of equivalence. Ask if these numbers are really one and the same quantity, or if each is just a little bit different. Agree with them that they are all equivalent; all different names of the same absolute point. Each name is just as true and accurate as any other, and no name is bigger or smaller than any other name. If your students have immediate suggestions, begin writing them down, illustrating with dividing lines drawn through your circles to allow any slower students to follow. If there are no suggestions, ask your students what would happen if you divide each circle in half. Allow them to take it from there, and write their list of the ‘names of two’ on the blackboard. Give each student a copy of the Number Names worksheet, and encourage them to make their list of names for 3 and 4 as long as they can. 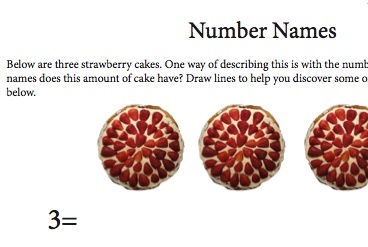 If they have difficulty keeping track of multiple lines on their strawberry cakes, encourage them to draw their own sets of three or four circles and make the divisions on separate pictures. This next part of this lesson plan can be taught as a separate lesson if your students go slowly through the whole number section. Remember, going slowly is not necessarily a bad thing; it may mean your students really are taking the time to think things through and really cementing these concepts in their minds. Write two fractions down on the board: 2/3 and 2/4. Tell your students these are portions of two different regular sized snickers bar at your house, and ask them which is larger. When they tell you 2/3 is larger, write that down using a > symbol. Ask them how they knew. Bring them to observe that the fewer pieces you divide something in, the larger the pieces are; and a third is larger than a fourth. Note that since the numerators are the same, the denominators will tell which is larger; and the smaller the denominator, the larger the portion. Ask them how you could check this. One way would be laying the two snicker bar portions side by side. Since the snicker bars are somewhere else and that isn’t possible, you can also check by drawing diagrams, being careful to make neat thirds and quarters. Draw a visual fraction model and shade the areas, demonstrating that 2/3 is larger than 2/4. Now write 2/3 and 2/4 on the blackboard again. Tell your students that this time, these are not snicker bars, but cakes. After the 2/3, write Mollie’s birthday cake. After the 2/4, write Jennie Brown’s cake. Ask which is larger. After your students have answered, draw the cakes. Tell them Mollie’s cake is a 12” square. Tell them Jennie Brown’s cake is a three layer wedding cake, with a radius of 22”. Ask them if their answer is still right . Ask them what went wrong in their thinking; or why the method they used for comparing parts of snicker bars didn’t work for comparing parts of cake. Bring them to observe that you can only compare fractions if they refer to identical wholes. Let them know, though, that when they see fractions without designation in math problems, they may assume they are referring to identical wholes unless told differently. In story problems, though, they’ll need to be careful. Now write 2/4 and ¾ on the board, and tell your students these fractions refer to snickers bars again. Ask which is larger. When they tell you ¾ is larger, draw the < symbol between the fractions. Ask how they knew. Bring them to observe that if the denominators are the same, the fraction with the larger number in the numerator is larger. This is because the identical denominator means the pieces are the same size, and the larger numerator means you have more pieces. Ask them how they could check this: with a picture. Draw the picture, demonstrating that ¾ is a larger piece. Now write ½ and 2/4 on the blackboard. Ask which is larger. Observe this is more difficult to compare by looking at the numbers because neither the numerator or denominator are the same, but ask them if they can rename ½ into something else. Suggest they draw a diagram of ½, and divide each portion in half again to find the ‘new name’. When they rename ½ as 2/4, the denominators become the same so that they can be compared easily: in fact, the two fractions are both 2/4, exactly the same. Give your students the fraction comparisons worksheet, and ask them to fill it out. They’ll be asked to use the symbols >,<, and = when they compare fractions, and they’ll also be asked to justify their conclusions with a simple circle diagram, a visual fraction model. c. Express whole numbers as fractions, and recognize fractions that are equivalent to whole numbers. Examples: Express 3 in the form 3 = 3/1; recognize that 6/1 = 6; locate 4/4 and 1 at the same point of a number line diagram. d. Compare two fractions with the same numerator or the same denominator by reasoning about their size. Recognize that comparisons are valid only when the two fractions refer to the same whole. Record the results of comparisons with the symbols >, =, or <, and justify the conclusions, e.g., by using a visual fraction model. This is only the beginning: your students need to cement their understanding of ordering and comparing fractions by doing lots of games and exercises. Take advantage of everything Mathwarehouse has to offer–all free— by visiting https://www.mathwarehouse.com/fractions/ and also looking through our lists of free lesson plans.